In what is being described as "laying the Bofors ghost to rest", the first two M777 howitzer guns manufactured by BAE System of USA arrived in India and were test fired at the Pokhran field firing ranges to mark 'Pokhran Day', marking the first nuclear test by India at Pokhran on 18 May 1974, described as "peaceful nuclear explosion". Arrival of these guns also marks a boost for Indian Army, 30 years after the Bofors howitzers were introduced in the Artillery. After almost seven years of discussion, trials and choosing, India and the US inked a nearly Rs 5,000 crore deal for 145 x M777 ultra-light howitzers last year; India signed the Letter of Acceptance (LoA) on November 30, which formalized the agreement. This broke the decades long jinx of our artillery having been starved of inducting new artillery guns after the Bofors scandal, following which India blacklisted the Swedish firm. The blacklisting resulted in drying up the supplies of spare parts and assemblies for these guns also. In fact, during the Kargil, Conflict, of the 400 x Bofors guns imported, only quantity 100 could be cannibalized. The offsets, under which BAE Systems, manufacturer of the gun, will invest about $200 million, will be pursued independently. While 25 guns will come to India in a fly-away condition, the rest will be assembled at the proposed assembly integration and test facility for the weapon system in India in partnership with Mahindra Defence. 40 Indian companies will be eligible to be part of the supply chain. Of the 25 M777 howitzers to be imported, the first two howitzers were to be delivered within six months of the contract being inked — which have just arrived. The rest are to be delivered at the rate of two per month. 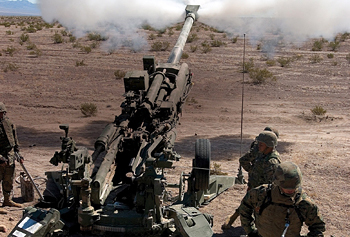 Army had successfully tried and selected BAE Systems M777 155mm/39-calibre light-weight howitzers guns from the US years back but the procurement was stymied over an anonymous letter alleging bribes. The M777 guns are ideal for mountains. Besides they can be airlifted swiftly to beef up high-altitude areas along the Line of Actual Control (LAC) with China in emergent situations. These guns will also be mainstay ordnance for artillery regiments of the Mountain Strike Corps. Built with titanium and aluminum alloys, the M777 is 155 mm/39-caliber howitzer that weighs only 4,218 kgs, compared to the 155mm towed howitzers that weigh twice as much. This gives the former superior tactical mobility including facilitating their swift deployment in mountains under slung from helicopters. With a range of 35-40 kms, it is ideal for deployment in mountains along our borders with Pakistan and China. At the same time while the mountainous regions along the western frontier has good roads (where these howitzers can be delivered by tuck, the border infrastructure is poor along the China border, where heavy gun cannot be transported due to poor road connectivity, leaving critical gaps. Movement of guns under slung by helicopters or dismantled and airlifted to mountainous regions is possible but should not be permanent arrangement. Therefore, special focus is needed to develop the border infrastructure in that sector speedily. The M777s have been used during operations in Afghanistan and Iraq, while more than 1,090 M777 guns are in service globally. India will be the latest user of these howitzers operated by the US, Australian and Canadian militaries for accurate artillery fire support. Presently, Indian Army holds 180 pieces of 130mm/39 calibre M-46 Russian guns that were upgraded to 155mm/45 calibre by Soltam of Israel. In addition in 2012, tenders were floated for 1,580 towed guns of 155mm/52 calibre, 100 tracked guns of 155mm/52 calibre and 180 wheeled and self-propelled guns of 155mm/52 calibre. The Army has some 264 artillery regiments but most of them are equipped with the 1970's era of 105mm Indian Field Gun (IFG), in addition to some regiments equipped with 130mm M-46 howitzer guns Supplied by the Soviet union in 1960's. The latter howitzer guns have been upgraded to 155 mm but such upgraded howitzer guns can hardly compete with modern computer aided artillery howitzer guns in warfare. Army's long-term plan to replace these with 155 mm howitzers recently received a boost after DRDO produced the 'Dhanush' based on specification and manufacturing know how received under Transfer of Technology (TOT) more than three decades ago from Bofors of Sweden. As per reports, Army is to initially order 114 x 155mm,45-calibre howitzer 'Dhanush' to equip a number of medium artillery regiments. Subsequently, Army is to reportedly place an order for another 300 or more Dhanush guns. However, the yearly capacity of the Ordnance Factory Board to produce the 'Dhanush' gun was only 16 till 2015. There were plans to increase the yearly production rate to 36 during year 2016 but whether this has been affected is not known. But even if the production is increased to 36 per year, it will take more than a decade to equip the artillery with 400 plus of Dhanush guns. Acquisition of the 145 x M777 155mm/39-calibre light-weight howitzer guns simultaneous to the indigenous Dhanush will provide the much needed boost to the artillery. The M777s will be followed by new 155mm/52-calibre tracked self-propelled guns. Private sector defence major Larsen & Toubro and South Korea's Hanwha Techwin (HTW) on April 21 signed a $720-million contract for the artillery gun program. The army will be supplied 100 K9 VAJRA-T guns. L&T plans to begin production of the guns at Talegaon near Pune in Maharashtra and is expected to deliver them within three years. An improved version of HTW's K9 Thunder, the K9 VAJRA-T, has been designed to meet Indian requirements, including those of its desert formations.